In late March, 17 UN Youth Volunteers from 7 countries came together for an Assignment Preparation Training (APT) in Nairobi. The training supported the volunteers in gaining a deeper understanding of how volunteerism can contribute to peace and development efforts through the role of youth volunteers, by exploring and practicing leadership, conflict management and communication skills. Participants in the Assignment Preparation Training in Kenya engage in a role play. "This has been the most useful and fun training I have been to," says Edgar Kiliba, UN Youth Volunteer Web and Social Media Communications Associate for the UN Resident Coordinator’s Office in Tanzania. Edgar was one of 17 UN Youth Volunteers who participated in the Assignment Preparation Training in Nairobi and are being deployed to five countries on the African continent. Learning and development are be a central part of a UN Youth Volunteer assignment. This is underlined by the 2014 UN Youth Volunteers Policy Note where it states that learning aims to improve the quality of the assignment and improve volunteers’ motivation. These notions are central to Assignment Preparation Trainings for UN Youth Volunteers which every UN Youth Volunteer undertakes in the duration of their assignment. Planned in coordination with the UNV Capacity Development teamat UNV headquarters, the APT is designed to cover areas like youth participation and volunteerism; how to achieve the Sustainable Development Goals through voluntary activity; identity and inclusion; living and working in a cross-cultural environment; learning; personal and professional development; and peer support and knowledge-sharing. These areas are central to a UN Youth Volunteer’s assignment and will support the volunteer in successfully engaging in their assignment. 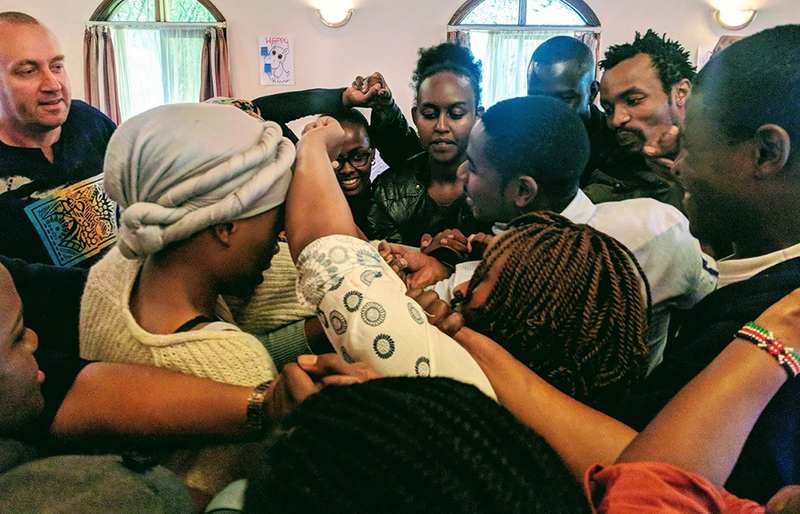 In Nairobi, the UN Youth Volunteers gained an overview of UNV’s priorities on the African continent and the role of UN Youth Volunteers in achieving the SDGs. The UN Volunteers were given the opportunity to discuss and interact with three former UN Volunteers to learn more about the assignment, challenges and success moments, career development and the experience overall. To enhance intercultural awareness and sensitivity, not only towards the country of assignment but also towards the host agency, the training also focussed on working in cross-cultural environments and adapting to different societal and organizational contexts. This was made practical through a range of interactive role plays. The Youth Volunteers were also trained in leadership skills and working in teams. "That was my favourite moment of the workshop," says Edgar. "It was a scenario involving conflict in the workplace. We had to do a short skit showing how the conflict arose and how it was resolved. It was a lot of fun and people got very creative!" Finally, the Youth Volunteers were also given the opportunity to speak to Jayathma Wickramanayake, the SG’s Youth Envoy of the United Nations. Wickramanayake said of the meeting: "The UNV Youth modality is something that we really look after and something that we really appreciate, in terms of navigating the fierce bureaucracy of the UN to bring youthful energy in the system."